For more information on this method, please visit the EPA's CFR 40 website. Clean Air Express Air Cooled Method 30B Heated Sampling Probes feature a unique stainless steel sheathed design that allows quick and easy replacement of speciated sorbent traps, stack thermocouple, probe thermocouples, and trap thermocouples. 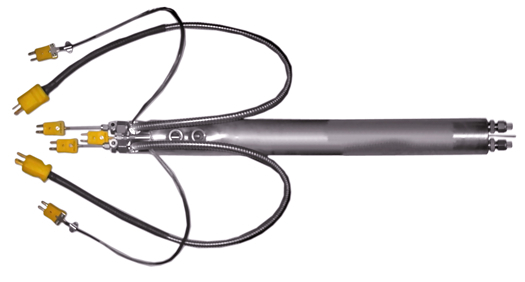 The Air Cooled Probe heaters are designed to heat each trap independently. Procedures similar to EPA Method 30B for sorbent tube sampling and commonly referred to the FAMS method will be used for sampling of gaseous mercury, including speciation of elemental (Hg0) and oxidized (Hg2+) forms at the FGD Inlet location. Known volumes of flue gas will be extracted from a single point in the flue and passed through paired mercury speciation sorbent traps utilizing potassium chloride-coated quartz and iodated powdered activated carbon. The trap is heat-controlled to 95°C ±5°C. Glass liners will extend from the traps into the stack flue gas.